Heaters that sit inside your fish tank look downright awful! You see that long slender tube firmly stuck to the glass of your tank? Wouldn’t it be great if your heater could be hidden away from the world, externally heating your tank? An in-line heater allows you to do exactly that! Perfectly heated water for your fish, as if by magic. Sound appealing? I thought so. Today, I am going to teach you everything you need to know about my favorite aquarium heater so that you can free your tank from unsightly clutter. What is an in-line aquarium heater? What are the pros and cons of in-line aquarium heaters? What is the best in-line aquarium heater? Most aquarium heaters sit inside your fish tank, clearly on display. An in-line heater, on the other hand, is plumbed into your aquarium’s filtration system, on the outflow line, heating the water as it returns to your tank. In its simplest form, an in-line heater is little more than a pipe with a heater element. As the water flows through this ‘pipe,’ it is heated to a preset temperature before being returned to your aquarium. Once this temperature is reached, the in-line heater switches itself off by using a built-in thermostat. At this time, water still flows through the heater but will no longer be heated. Once the temperature drops, the in-line heater switches back on again… And, the cycle continues. Let’s face it, having a submersible heater on display, inside your tank, looks awful. It distracts the viewer from all the painstaking effort you spent on perfectly recreating your fish’s natural habitat. Because an in-line heater is located externally, all that you are left with is the beauty of your fish floating around – nothing ugly. Another problem with submersible aquarium heaters is that they inefficiently heat your tank. The water closest to the heater will be the hottest. Water from an in-line heater flows back inside your tank and circulates, evenly distributing the heat. Did you know that if you use a submersible heater, then you need to switch it off every time you do a water change? If you don’t, you risk destroying your aquarium heater, leaving your fish in the cold. Not only can submersible heaters overheat when exposed to air, but when hot glass comes into contact with cold water, like from a water change, it can crack from the sudden change in temperature. But that isn’t the case with an in-line heater! You can keep it running through each water change – you don’t have to worry about forgetting to turn the heater off or back on. There is no ignoring the price of in-line aquarium heaters – they are twice as expensive as your standard submersible heater. Those of you who are trying to set up a tropical fish tank on a budget may be put off by the price. While you could always go the DIY route, those of you who want a ready-to-go in-line heater that just works will need to fork over the money. This downside is so obvious that you might have missed it. If your sump or canister filter fails or is turned off, no water is pumped through the heater. This means the water temperature of your tank is going to drop until the flow returns. One more thing to keep in mind is that if the in-line heater is switched on, and no water flows through it, you risk damaging the heater. Fortunately, most quality in-line heaters have an automatic shut-off in the event that they run dry. Every extra piece of equipment you add to the line increases the chance of leaks occurring. Especially if the in-line filter is not installed correctly. However, care during installation and using the correct tools and equipment will minimize any possible chances of leaks occurring. 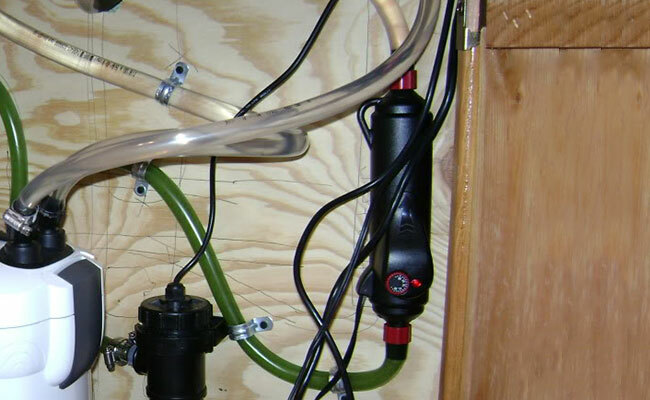 So, you just bought a brand new in-line aquarium heater, and now you want to install it. You may be wondering why most in-line heaters recommend that you install them in an upright, vertical position. The reason is actually pretty simple – to prevent bubbles and dry spots. You see, in-line aquarium heaters have an automatic shut-off to protect them in the event that they run dry. But if you position the in-line heater on an angle – or worse, horizontally – you risk air bubbles creating dry spots on the glass that lines the heater. Broken glass and leaking water. And, that’s a headache you don’t want to deal with. For the sake of your tank, I highly recommend installing your in-line heater in the vertical position. Bonus tip: Before you turn the heater on for the first time, wiggle the hosing and heater to let any trapped air bubbles out. But what happens if it fails? Let’s say that your in-line heater doesn’t turn off when it reaches your set temperature. Instead, it just keeps heating. Yep, you are going to cook your fish. There are hundreds of horror stories where hobbyists discovered that they made fish soup, all because of a faulty heater. It’s an expensive and sad accident. While the chances of this happening might be low, why risk it? After all, you install a smoke alarm in your home for a similar reason… Just in case. That’s why I recommend adding a reliable aquarium heater controller to your fish tank. 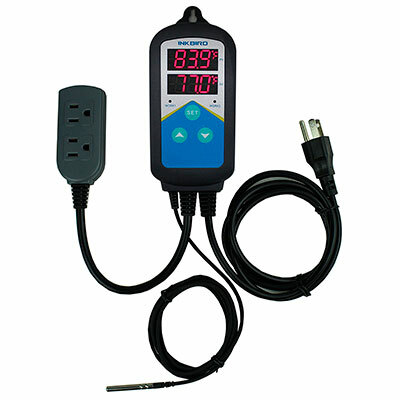 A heater controller acts as a fail-safe, monitoring the temperature of your aquarium and cutting power to the heater once your preset temperature is reached. Yeah, I know it’s another aquarium product that you need to invest in. But if your heater ever fails, you will be glad you made the investment! Sure, it may be tempting to install the in-line heater on your inflow. You know that brown sludge that builds up inside your filter? Well, that same stuff can accumulate over time on the inside of your in-line heater. Once the water comes out of your in-line filter, it then must pass through your filter and back into the tank. While temperature loss is minimal, it can increase the time it takes for your tank to reach the optimal temperature. These problems won’t be an issue if you just install the heater on your return line. The Hydor in-line aquarium heater is the best on the market. Don’t be fooled by its small size. This in-line heater is a pocket rocket, capable of heating your aquarium while remaining hidden from view. On the body of the heater is a small loop that allows you to hang the heater from a hook. On my tank, however, I use a zip tie through this loop to secure the heater to my return line. With just 0.1 degree of a temperature swing, it was a huge improvement over my Tetra submersible heater, which had swings of 2 degrees. And set up is a breeze! Simply clamp your hoses onto the heater, plug it in and you are good to go. But perhaps best of all is Hydor’s faith in their product. You can take advantage of a 2-year manufacturer’s warranty in the event that your product fails. 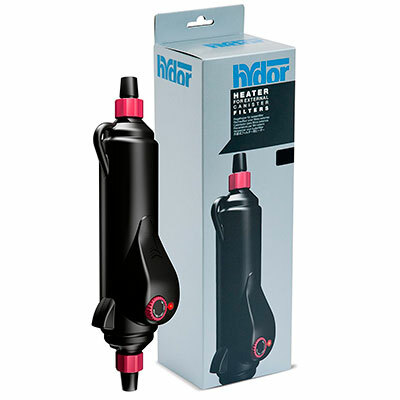 All told, Hydor offers 6 different in-line heaters – 3 imperial and 3 metric. Choose the right model for your aquarium – you don’t want to buy it just to discover the heater is too weak for your tank or that the hose attachments don’t fit your tubing. As you see, when installed correctly, an in-line heater is a great way to regulate the water temperature in your aquarium. Do you use an in-line heater or have any advice to share on the subject? Let me know in the comments below! I happened to stumble across your page and the info is really great for those of us starting out! So Im new to fish tanks, but have set up a 405L tank, running 2 Eheim Classic 600 canister filters with glass lily in and out flows. You may only need a single heater, if it’s rated high enough. However, you will need to be mindful that there could be a far bit of temperature loss as water passes through the non-inline heater filter. How much depends on the length of hosing, external temperature etc. etc. Calculating this exactly is tricky and unfortunately beyond me. As for whether or not it’s the right option, I cannot say, it depends on your external temperature and the temperature difference you want your aquarium raised to. I am converting a fish tank into a turtle tank. The fish have all been moved to another tank. I have an inline heater that ran on the fish tank with a fluval filter. After the fluval stopped working, I replaced the impeller and the gaskets etc., but it still isn’t working. Fortunately, I have a new in box (but many years old) Odyssea canister filter. Unfortunately, the outtake tube is significantly smaller than the tube on the fluval (it won’t fit any commercially available inline heaters).The intake tube is much larger and fits the inline heater perfectly. I would prefer to have an inline heater, because the risk of the turtle breaking it is nonexistent. However, I know I can’t put the heater on the intake. A new heater is in my budget, a new filter isn’t. Any ideas? You should be able to find a reducer according to your plumbing. Note, you might need to join a few reducers together to get your desired size. Depending on where you are located, you may be able to find these at plumbing or hardware store. These things are much cheaper than a new heater. Thank you for the information. It was very helpful. I am looking into inline heaters and already use a Hydor canister filter (5/8′ hose) so the 300W will be just right. In my area the inline heater ($80) is just about double the tank heater ($40) cost. This is the unfortunate downside of using inline heaters, while they do allow you to remove the heater from your tank, you pay a premium to do so. Hi im setting up a 350ltr marine anx am looking at external heaters. The hydor appears to only cope up 300ltrs.can you recommend a more powerful one. Im in uk. Tank in middle oc house not affected by windows or doors. So temp remains pretty consistent. I’m not familiar with availability in the UK. Here in the US, besides a dubious chinese 500W in-line heater that soon broke on me, there isn’t any in-line heaters that exceed 300W aimed at aquariums. 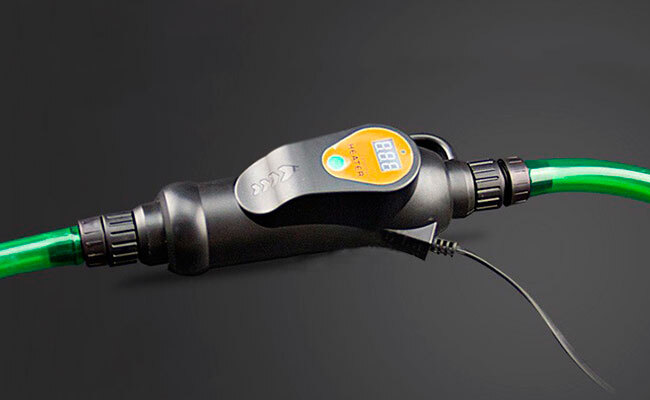 If you need something more powerful, there are DIY solutions available which use a submersible heater as the element. Some people have even used hot-tub heaters on larger tanks. Unfortunately. Both of these require some plumbing skills on your part. Whether this inline heater will work for you entirely depends on the size of your tank and the temperature difference of your tank vs. your room. For instance, the 300W will heat a 250L tank up to 10˚C warmer than the room temperature. When you say diffuser, are you talking about something that will slow down the rate of water, as it enters your tank – for less surface agitation? If so, then this should come after the inline heater. I think he may be talking about an inline CO2 diffuser, as I have the same query. I am setting up a tank for the first time and want to keep as much out of the tank as possible. I have decided on an inline CO2 diffuser for plant growth and am now considering using an inline heater as well. Do you think this is advisable have 2 inline devices, and if so which way round should they be? The cannister filter I have purchased also has a spray bar outlet, would this have any bearing on it? Ohhh CO2 diffuser. Now we are on the same page. Inline co2 diffusers should be installed after the heater. You don’t want any bubbles going through the inline heater. Like air bubbles, it’s possible they could create dry spots and burn out the element of your inline heater. The only drawback of having this set up I can see would be reduced water flow. 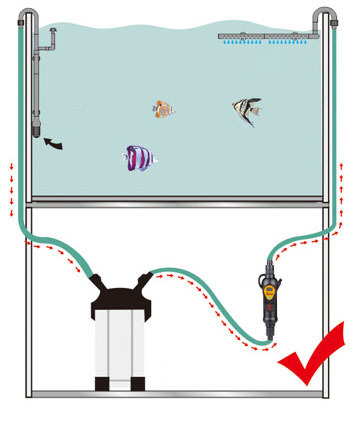 Adding the spray bar as the final point before water enters your tank would reduce water movement further. However, this may or may not be an issue depending on your set up.